Transformer works on the Principle of Faraday’s Law of Mutual Induction. This principle states that the rate of change of flux is directly proportional to the induced electromagnetic flux. 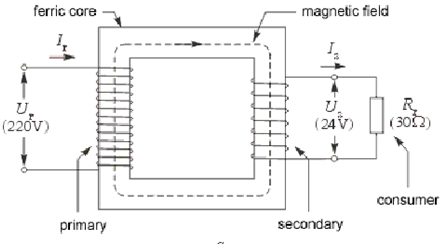 Similarly, in a transformer, when an alternating current flows through one of the coil, it creates a magnetic field around it, which constantly produces a changing magnetic flux and so, when another coil is brought near it, some of the EMF is also induced in the secondary coil as well. Since the secondary coil forms a closed loop, the EMF produces the current in it as well. So in short, this mutual induction between the coils is responsible for transferring the electric energy. These windings are usually made on an iron core to make the magnetic field stronger, and laminated afterwards, so that the flux does not weaken due to air, which is a perfect insulator. But still some power losses are observed such as Eddy Current losses and Hysteresis loss. If we increase the number of turns in the secondary coil, such that they become greater than the number of turns in the primary coil, the induced voltage can be increased in direct relation. i.e. if the turns in the secondary are ten times the number of turns in the primary, then the induced voltage will also be ten times then the one in the primary. Similarly, if the number of turns in the primary coil is more than the number of turns in the secondary coil, the voltage induced will be lesser than the original voltage. This property of Transformer is really useful in transferring electrical energy especially over long distances. To avoid power losses, initially a step down transformer is used and at the receiving end, a step up transformer is used which builds up the voltage on the required level. Such types of Transformers are known as single phase, two windings voltage transformers. If the coils are connected in series, forming a closed loop, then the connection is known as a delta connection, but if the three windings are connected such that all have a common point then a Y-type connection is formed. It has a neutral wire at the common end point. Both of these connections are equivalent and are inter convertible from one form to another. In the next part of this tutorial, we will have a look on the construction of transformer, which I think is very essential for an electrical engineer to know. I will explain the basics of transformer design like windings etc. and will check how to design a transformer. So stay tuned and join our newsletter via email so that you get these amazing tutorials rite in your mailbox. Take care. or copy this trackback: http://engineering.electrical-equipment.org/electrical-distribution/what-is-a-transformer.html/trackback from your own site. I’m glad you explained that the transformer moves electricity by mutual induction. I had wanted to buy one, I just didn’t know how they worked. It would be helpful to have some extra voltage. Thanks for the information! Very awesome content its really helpful for me. thanks for that post. but could you tell me about relays which is used in transformer.